Can you identify anyone in the bridal party? 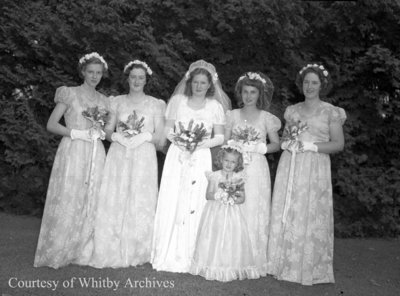 A black and white large format negative of the Brown-Eastwood bridal party on July 28, 1948 in Greenwood, Ontario. We believe the bride to be Mildred Brown and the groom to be Glynn Eastwood. In this photograph from left to right: Eileen Slute (nee Sadler), unidentified, Mildred Brown Eastwood, unidentified, unidentified, unidentified. Brown-Eastwood Wedding, July 28, 1948, Marjorie Ruddy. Whitby Archives A2013_040_358.